It was a single feather in the palm of GU Bojian's hand that got him going. That feather, he realized, was from a green peacock, an endangered species once found throughout China and culturally well known but that it is now on the verge of extinction. That, of course, means that very few Chinese will have ever laid their eyes on this magnificent bird. Gu's intriguing encounter with that feather in 2013 piqued his interest and resulted in him becoming a frequent visitor to a remote corner of Yunnan in southwestern China to this day. His mission: to find a well-hidden, secluded haven in which he reckoned the green peacock must be making its last stand. In 2013 when he came across the feather, Gu was a researcher at the Xishuangbanna Tropical Botanical Garden (XTBG), a research institute that is part of the Chinese Academy of Sciences, in Xishuangbanna, Yunnan province. Carrying out field research for his master's degree, he reached the Luzhi River valley, 200 kilometers from the provincial capital, Kunming. GU is also an amateur wildlife photographer and bird watcher and often asked local farmers about birds there. "The farmers told me that there were still 'old peacocks' living in the area," GU, 28, says. "I wasn't convinced until they brought me a feather of the species that they had found not long before." Gu was aware of the green peacock and that it was endangered but he had never seen one before. "These things are so hard to find that a lot of really experienced bird watchers had thought that in the wild in China they had died out," GUu says, holding the peacock feather in his hand. So he was immediately intrigued with the area. As GU carried out research on plants there he also spent a lot of time looking for evidence of green peacocks. There he ventured into river valleys unspoiled by roads and was surprised not long later to find a large area of well-preserved monsoon forest that stretched more than 80 km along the Luzhi River and its mainstream Honghe River. In any spare time he had over the next three years he revisited the region, sometimes with other scientists and conservationists, and feathers, footprints and the calling sounds of the green peacocks were heard in the valleys. They were eventually also able to photograph green peacocks feeding and mating on the river beaches. Observations over the past few years have proven that habitat, which covers a total of 190 square kilometers, has the densest concentrations of green peacocks throughout Yunnan. Experts and environmental organizations say the area is possibly the "last piece of intact habitat" for the rare bird in China, and is critical for its survival. GU has done a lot of research to find out how it was that the bird retreated to the remotest corners of the country and had become endangered as well as other research, and has been unsparing in his efforts to protect the key piece of habitat. "When people talk about peacocks nowadays, they are always talking about blue peacocks," Gu says. "Most Chinese don't even know what a green peacock is." WEN Cheng, a member of the survival commission of the International Union for Conservation of Nature, says that in general peacocks are relatively common. 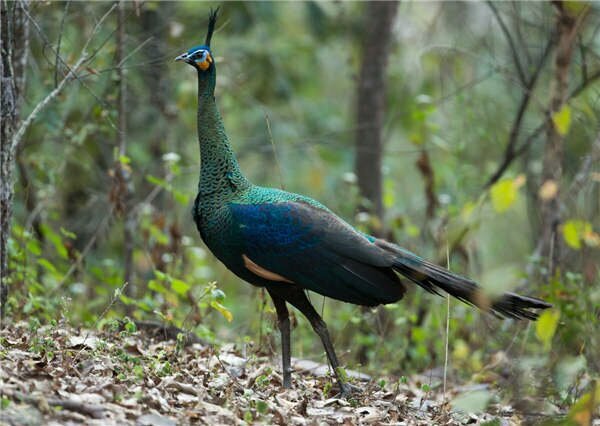 Those often seen in China now are usually blue peacocks (Pavo cristatus) that originate in India. But the green peacock (Pavo muticus) is much less common, and the union lists it as endangered, saying there are fewer than 20,000 worldwide. In some Southeast Asian countries green peacocks also face severe problems such as fragmenting habitats and the number of wild ones has halved in just 20 years. As a native species of China the green peacock has cultural significance, GU says. The beautiful pheasant has always been a symbol of good luck and nobility in traditional Chinese culture, and was often cited in ancient literary works or described in traditional paintings. Archaeological findings, including bones excavated in central Henan province dating back 4,000 years suggest that green peacocks were widely distributed south of the geographical line marked by Qinling Mountains and Huaihe River. "However, because of the destruction of habitats and hunting, green peacocks have disappeared in these regions gradually, especially in modern times," GU said. He found very little modern research about the species, just nine papers in Chinese and one in English. These papers, mostly written in the 1980s and 1990s, suggested that Yunan province had become the only region with wild green peacocks in recent decades. In fact, it is regarded as a name card of Yunnan province. The last comprehensive survey on distribution of China's wild green peacocks was done by the Kunming Institute of Zoology of the Chinese Academy of Sciences and published in 1995. It estimated that between 800 and 1,100 green peacocks lived in Yunnan. However, a rough survey by the same institute two years ago estimated that the entire population had fallen to fewer than 500, and that they lived in disparate small groups, reducing the chances of propagation. "You could easily see that in many places green peacocks had lived in 20 years ago they had simply vanished," GU says. One problem is that green peacocks are picky about their living environment, he says. River valleys with gentle slopes and tropical monsoon forests offer the bird proper humidity, sufficient food, drinking water and open space, making them ideal habitats for it. However, in southern and southwestern Yunnan, large areas of such environment have been reclaimed as farmland for tropical crops like banana and rubber trees in recent decades. The loss of former habitats has forced the species to retreat to remote river valleys, such as the river valleys along upper and middle reaches of the Honghe River. GU's joy at finding the habitat was short-lived. Within months, on one of his subsequent visits to the area, it became clear that these great survivors were now threatened by a hydro power station being built along the river. With building of the station, operated by a local water resources company, proceeded trees were felled and there had been heavy excavation work, severely damaging the environment, GU says. "Surveying the scene made me very sad." As building continues, riverside trees will be felled and roads built, and that will irreversibly damage the local ecosystem, Gu says. If the water level rises as planned, an area of more than 40 km of low-lying valley along the Xiaojiang and Luzhi rivers, two branches of the Honghe River, are likely to be damaged. "That means the best parts of the valley habitat for green peacocks will be submerged." Many valuable and rare plants in the forests, including hundreds of cycads, would also be affected, he says. Realizing the urgency of the situation Gu decided to make a public plea for the green peacock and its habitat to be protected, and he put information online, drawing a wide response. Several wildlife organizations and experts in various fields, such as Xi Zhinong, a wildlife photographer, joined the effort. Even a local rafting team volunteered to send experts to carry out scientific research in the highly inaccessible valley area. In March last year three wildlife groups sent an urgent letter to the Ministry of Environmental Protection proposing suspension of the hydropower project in the river basin to save the green peacocks' habitat. Soon the Yunnan provincial office of the State Administration of Forestry opened an investigation on how construction of the hydropower station would affect the green peacocks and their habitat and promised it would call on local governments and departments urgently to take measures to protect the species' habitat. In July last year Friends of Nature, one of the oldest nationwide environmental organizations in China, initiated a public interest lawsuit against the hydro project operator, aiming to terminate the project because of its effect on the environment. The next month the lawsuit was formally filed in Chuxiong Yi autonomous prefecture in Yunnan, making it the first preventive public interest lawsuit for wildlife protection filed in China. It is now a cause celebre, one of the earliest cases of environmental groups taking legal action to protect important wildlife and their habitats, says GE Feng, a lawyer involved in the case. "Preventive public interest litigation is very significant socially. If we can stop the violation before the damage is done, we can reduce the costs to society," GE says. Joint efforts have brought positive results, he says. Construction of the hydro project has been on hold for a little more than a year now, and the provincial government has listed the green peacock as a critically endangered species and included the entire habitat area in a red zone, ensuring better protection. "It's a very good example of people from various backgrounds working together to protect a valuable species and its habitats," GU says. "Each organization and individual has played a role," GU says. The campaign continues to have the hydro project killed off. Many Chinese are familiar with wildlife in Africa thanks to TV programs, and, it is important that they learn more about native species such as green peacocks, GU says. "China has rich biodiversity. Scientists and the general public should pay more attention to these wild animals in our own country and give them better protection." Besides protecting the important habitat, Gu has also worked with environmental organizations to cultivate more public awareness of the species. Friends of Nature has initiated activities such as children's painting competitions to promote awareness of the species, public service advertisements have been put up in the Beijing subway, and lectures and art competitions with a green peacock theme have been held in cities. ZHANG Boju, secretary-general of Friends of Nature, says: "Some years ago people knew that pandas needed to be protected, and other species like the snow leopard have become animal stars and gained public attention in recent years, too. Green peacocks should be on that list." ZHANG suggests that more support from government departments is critical if the species and its habitats are to be protected in the long term. Better protection, including clearer guidance for practice and professional management of natural reserves and ecological red zones, is also needed, ZHANG says. It is imperative that local governments find a way to balance long-term ecological protection and economic growth, he says. For example, in recent years the Konglong River Nature Reserve, a county-level nature reserve for green peacocks in Shuangbai county of Yunnan, founded in 2003, has shrunk three times, losing 8 percent of its total original acreage, to make way for economic development in recent years. The species also faces other threats like poaching. For example, infrared cameras placed outside the Konglong reserve by researchers have captured images of poachers at work. Local communities have traditionally hunted the bird and are unaware that it is a nationally protected animal.